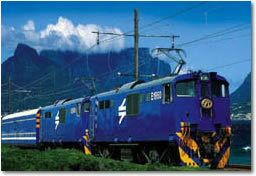 The Blue Train has an aura of mystique about it. Kings and presidents have travelled on this magnificent moving five-star hotel. Its very name has become synonymous with the ultimate in luxury and personal service. 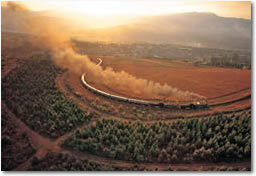 The routes of The Blue Train - both scheduled and chartered - take guests through some of the most breathtaking countryside to be found anywhere in the world. The Rovos Rail offers two beautifully rebuilt Classic trains, each carrying a maximum of 72 passengers who are accommodated in the most spacious and luxurious train suites in the world. The use of traditional furnishings and period d�cor ensure an atmosphere of elegance and grandeur in the Dining, Lounge and Observation cars. The Shongololo Express has designed four product ranges to satisfy different time frames as well as a variety of locations, tastes and interests. The Shongololo Express will give you a delightful adventure filled experience whether you have just a weekend, 10 days or a couple of weeks. Charters are also available for special interest groups, conferences, incentives.